You can see the Walnut back here. I love the Bavarian style architecture. once I got back Stateside in Cleveland, Ohio where I was doing another Seminar and played it there for everyone. It was so cool because the artists at Deering really outdid themselves by getting it done 2 weeks ahead of schedule! This is one of the entrances to the Bavarian Inn. 6-string Banjos, but getting together with Dickson Lester and playing his “Banjitar” really rekindled my interest to pursue it at this time. I’m so glad I did (You can read about that in BIT-33)! The Apple Strudel was absolutely delicious. This is the way all pastries should be filled! Deering has a nice lineup of Banjos for Guitarists to choose from. You can check out their catalogue online! Let them know I sent you! After the seminar in Cleveland we headed to South Bend Indiana to visit with friends for Thanksgiving. After that we headed up into Michigan and spent time with Buddy Houghtaling again in Battle Creek, and once again in the Thumb area with family and friends. On our way back from Sebewaing we stopped and spent the day in Frankenmuth. That is such a cool town, it is like visiting a Bavarian village all lit up for Christmas. 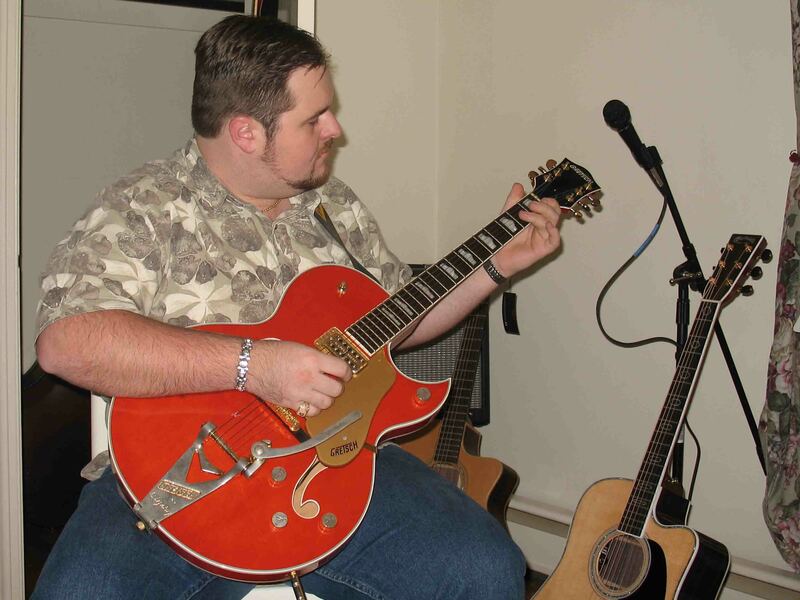 This is a really cool Gretsch that belongs to a friend of mine. I love the Florentine cutaway! After flying into Massachusetts we spent about a week visiting with family & friends and tomorrow we’re flying down to Florida for another event. I hope you all have a great time with your families & friends this Christmas & New Year!